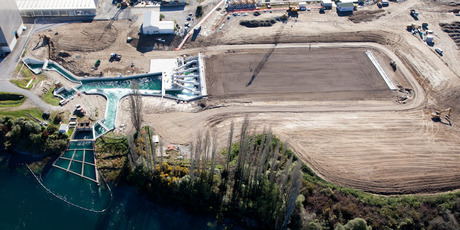 A one-of-a-kind new water treatment facility near Taupo is using gas-gobbling bacteria and 378km of underground pipes to clean Waikato River water. While it may make a fabulous water feature, Wairakei Power Station's new bioreactor is a serious piece of industrial plant, and a world first. It uses sulphur-oxidising bacteria to reduce the levels of hydrogen sulphide in the power station's cooling water. The $30 million bioreactor was commissioned in July and formally opened yesterday at Wairakei with a blessing from Rev Sonny Garmonsway of Te Pihopatanga o Aotearoa (the Maori Anglican Church) and Ngati Tuwharetoa. The bioreactor's follows years of trials and a 12-month construction project. The power station draws water from the Waikato River and uses it to cool geothermal fluid extracted to generate electricity. Hydrogen sulphide occurs naturally in geothermal fluid, but due to the power station's cooling process, some of it also gets into the cooling water. The new bioreactor pumps the used cooling water through 378km of pipes under a field next to the power station at the rate of 13,000 litres per second. Inside the pipes, the bacteria gobble the hydrogen sulphide from the water, removing up to 80 per cent of the toxic compound. The cleaned water is then returned to the Waikato River. The new bioreactor helps ensure Contact Energy, which operates the Wairakei Power Station, can meet strict new cooling water discharge resource consent conditions, which came into effect last month. The underground pipes provide an environment where the naturally-occurring bacteria colonise and grow to form a thin whitish film to remove the hydrogen sulphide as the cooling water flows through the bioreactor. Water takes about four minutes to travel the 378km of pipes, which equates to over three million litres of treated water being returned to the river every four minutes.